So the shoulder injury has been back since early September – 2.5 months. 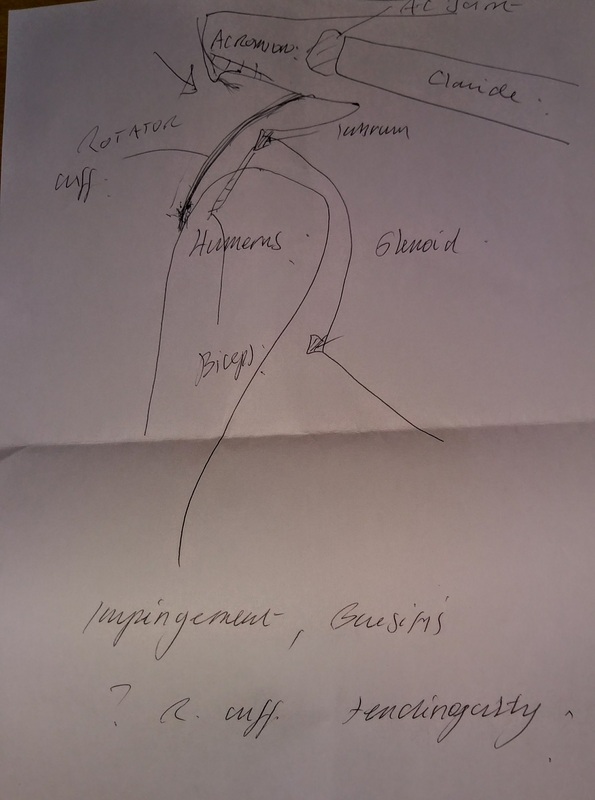 I went to see a specialist, Mr Mark Jeffery @ Wimbledon Clinics last week and he gave this provisional diagnosis and then requested an ultrasound which I had two days later and seem to confirm what he had predicted. The ultrasound person said I have a small tear but he doesn’t think that is the issue, and more likely to be age related. The bursa is thickened and there is shoulder impingement. What is shoulder impingement? It is caused by the tendons of the rotator cuff becoming impinged as they pass through the shoulder joint. In this case it happened through overuse, although funnily enough it came on a few months after I stopped doing regular weight bearing exercises for my shoulder at home (T25 mostly). So I’m going to get back into that routine once this is fixed. For the last two months or so I have been careful. I took a month off Capoeira and took Naproxen to see it would bring the inflammation down. I stopped Naproxen on the 5th of November and the pain came back same as before (while on Naproxen it was more an ache than pain) that’s when I decided to see a specialist with a view to getting another injection or surgery if it was a ruptured tendon, which, thankfully, it is not. I have been back to Capoeira for 2 weeks now, avoiding movements such as queda de rins, volta por cima, aú de cabeça, ponte… Anything that involves weight bearing and arm bending, anything that hurts basically. But now I can do bananeira and aú again. It’s been a challenge changing my game and training and working around the injury. At first I was really scared to play in the roda and it felt a bit pointless being in class when I couldn’t do so much of the floor work – hence taking the month off for rest, although by rest I just mean not going to class, I was training at home, doing leg work and physio for shoulder. But it’s also been interesting having to change my game and play with restrictions. I can’t play the berimbau for too long either because the shoulder starts to feel really tight after a while. I’m seeing the specialist again on Wednesday. He thought injection was probably the best, fastest solution in conjunction with physiotherapy (injection without physio is almost pointless as the pain will soon return if the underlying issue isn’t addressed). Remember: I’m not a doctor and the info here is particular to my case and the research I have done and for me to refer to. I kinda like these guys, this video is hot off the press, only one day old! Rotator cuff theraband exercises – 3 sets of 10 to begin with. Firstly position the shoulder blades: down away from the head and squeeze them (towards the back, we are trying to open up the shoulders) . Then lift the left (non injured) arm into this position. Get the shoulders into position, down, squeeze and pull rib cage in with core muscles engaged. Shoulders down, and squeeze gently, rib cage in, core engaged, then push hands down onto thighs on the out breaths. So I’ll be doing these little and often until next visit on the 5th. Lesson 1: no point in doing all the physio exercises if the shoulders aren’t in the right position. The right position feels very unnatural to me and stiff! IMPORTANT to note that squeezing the shoulders into position should not result in the back curving and the belly sticking out, always remember to pull the rib cage in and engage the core muscles (like the zip and hollow in Pilates/Abdominal bracing).